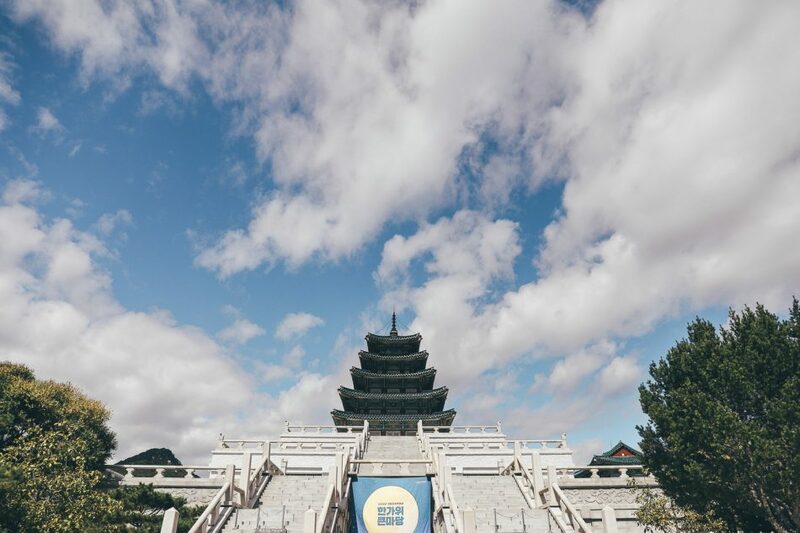 We ended of our trip to South Korea in the country’s capital city of Seoul. 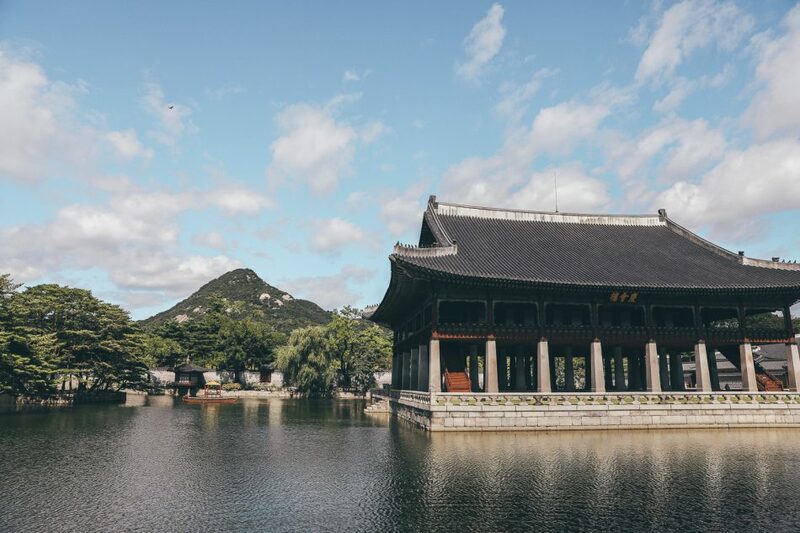 Known as the “Asian city that never sleeps”, Seoul is the lively bustling capital home to over 16 million people. 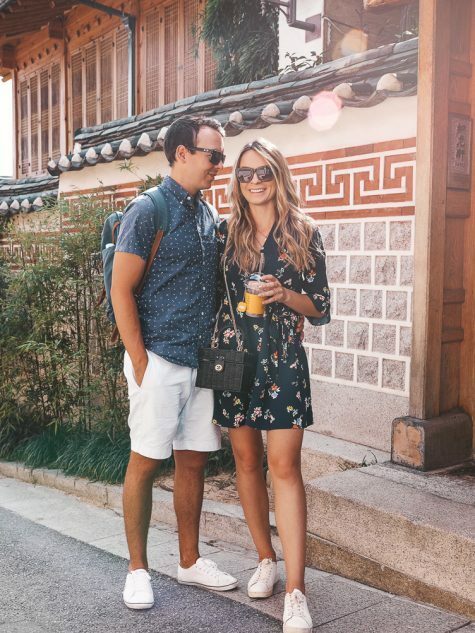 And we loved every minute of exploring this exciting city! 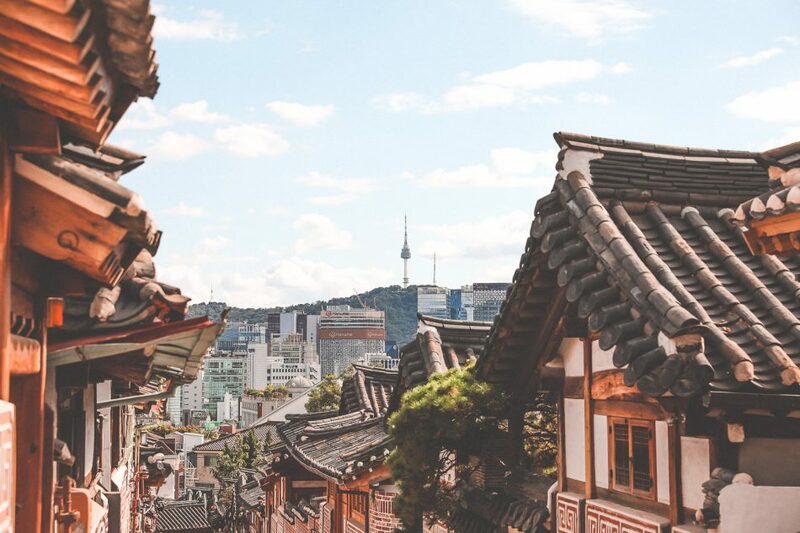 Seoul is fast paced and intense, bustling with residents that work over 10 hours a day and pulsing at night with an underground world of clubs, gamers, and hectic old world markets. 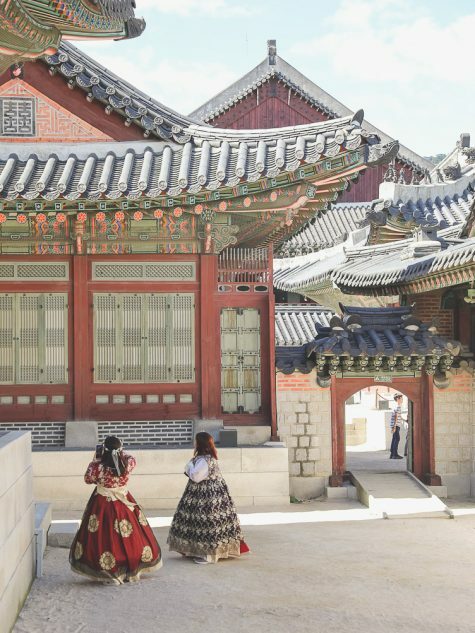 On top of that, Seoul is a delicate balance of old and new. The city is advanced, with futuristic technology, towering skyscrapers, and Wi-Fi everywhere you go. 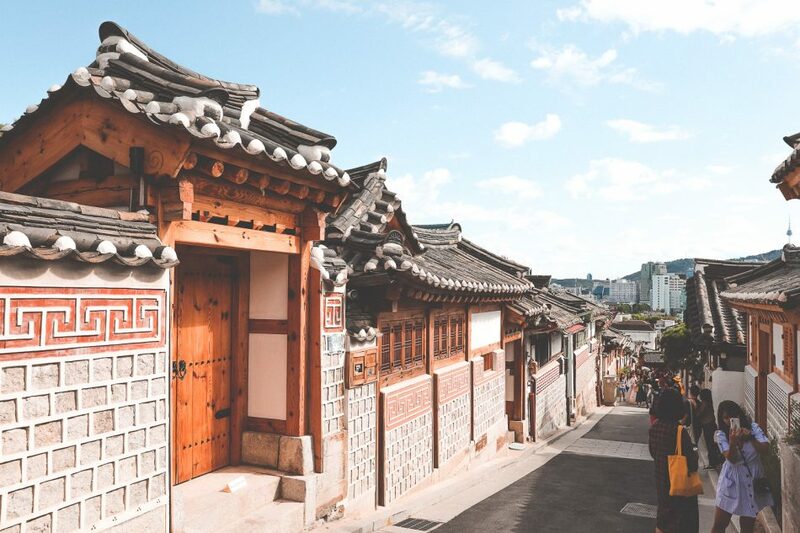 However, the city remains deep rooted in tradition, with ancient temples preserved between modern buildings and teahouses hidden among alleys of traditional wooden homes. 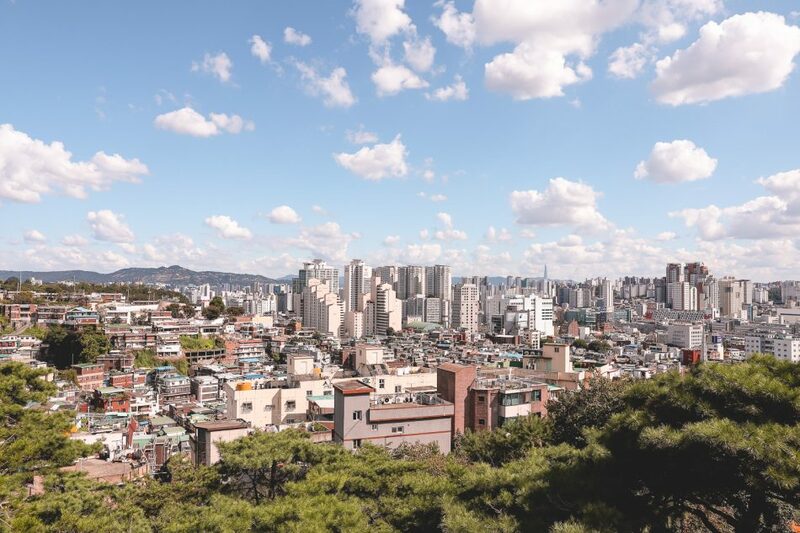 Seoul has demonstrated immense growth over the last few decades and is now one of the world’s megacities, transformed from a city of poverty to hi-tech prosperity. 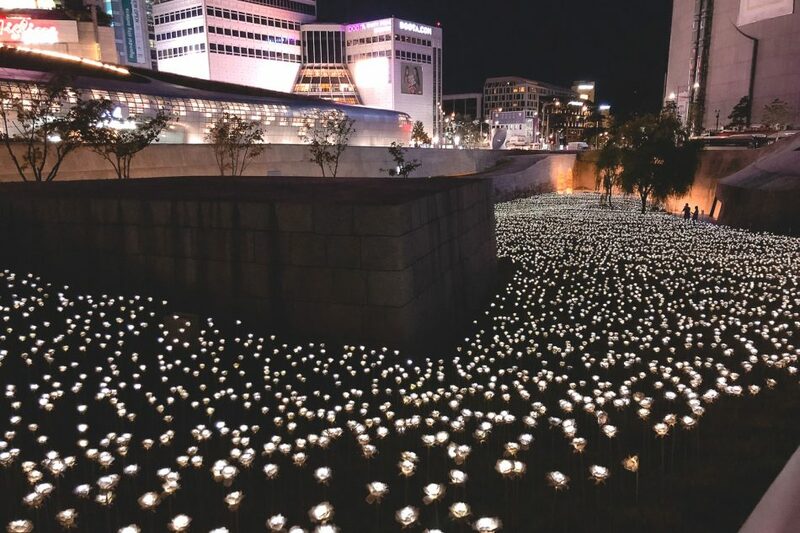 Polished pop-culture (“K-Pop”), Hyundai cars, and high end Samsung products have brought the world’s attention to South Korea. 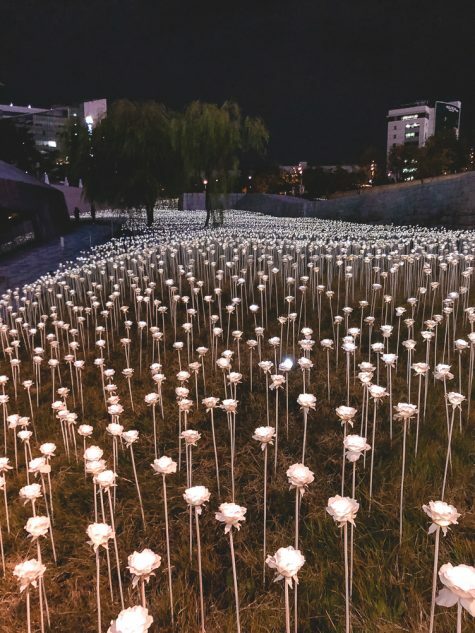 This can now be seen in the glitzy, modern financial districts in areas like Gangnam, where skyscrapers tower above you, the business crowd shops the luxury boutique-lined streets, and the nightlife is wild. 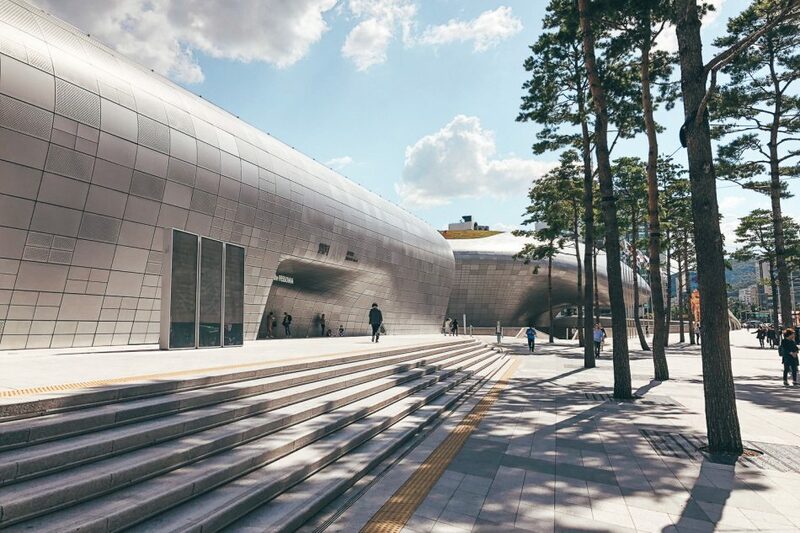 While exploring this area we popped into Samsung’s exhibition center, full of gadgets and games for the tech-savvy traveler. 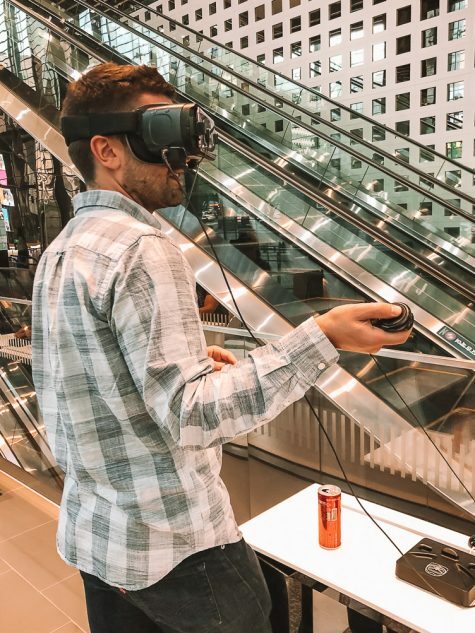 We played virtual reality games and took a step into a house of the future. 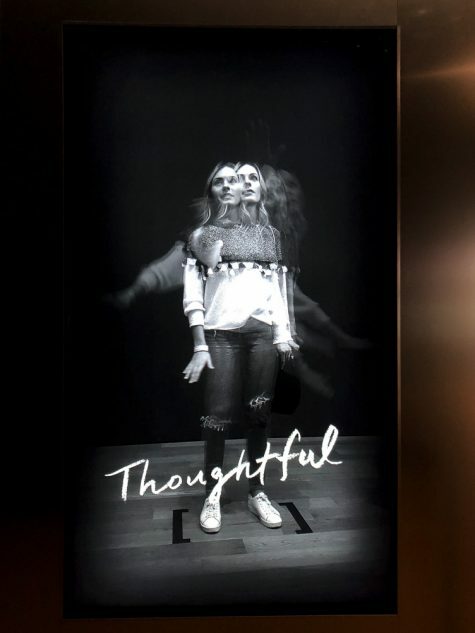 Most interestingly, there was a personalized “sensory experience” where you could participate in different activities to tell you about yourself. 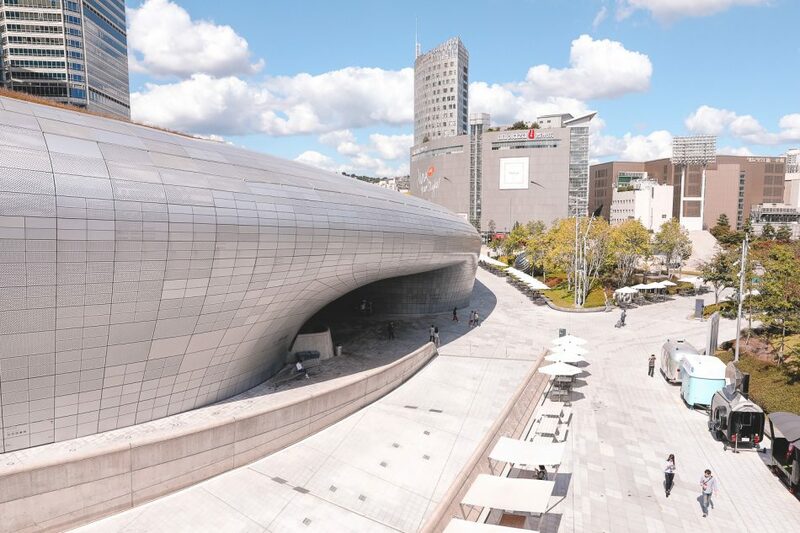 The Dongdaemun Design Plaza (DDP), designed by architect Zaha Hadid, is another of Seoul’s new advances. 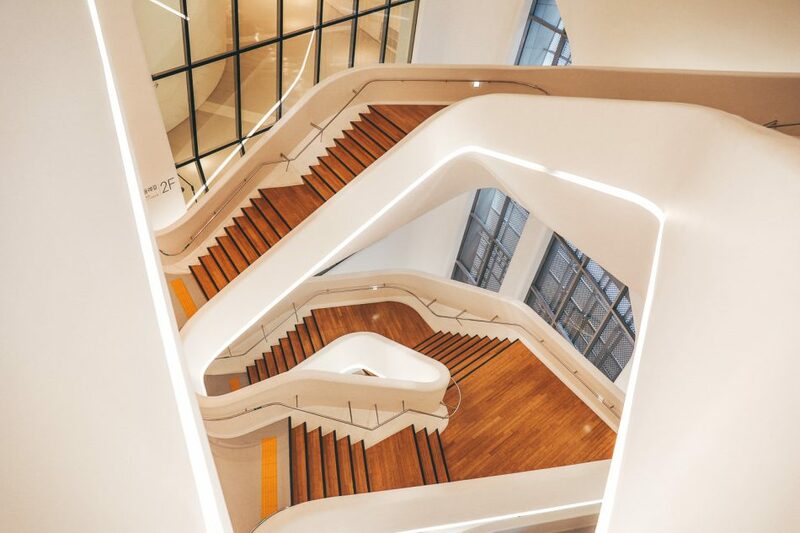 The sleek and modern building has the meaning of Dream, Design, and Play and hosts a variety of exhibitions, fashion shows, and conferences. 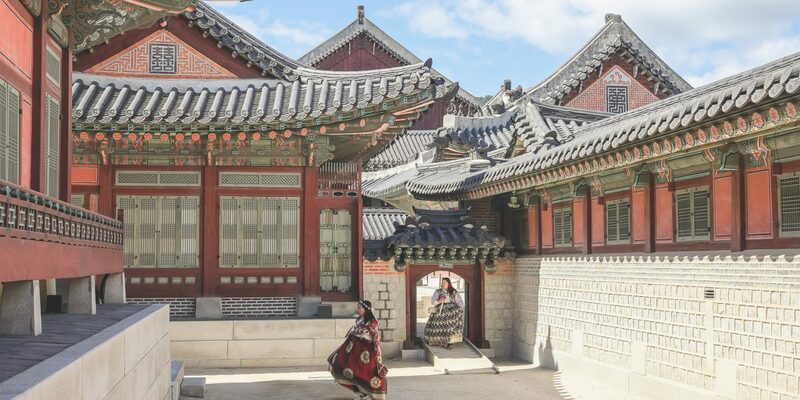 Nestled in the city’s otherwise chaotic city center are two large traditional palaces (Gyeongbokgung and Changdeokgung) which demonstrate traditional Korean architecture, gardens, ponds and pagodas. 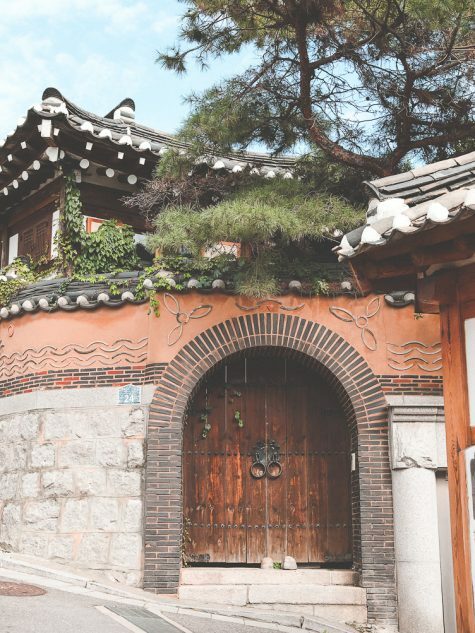 Between these two palaces is the Bukchon traditional neighborhood, one of the last places to see old-style Korean homes (hanok). 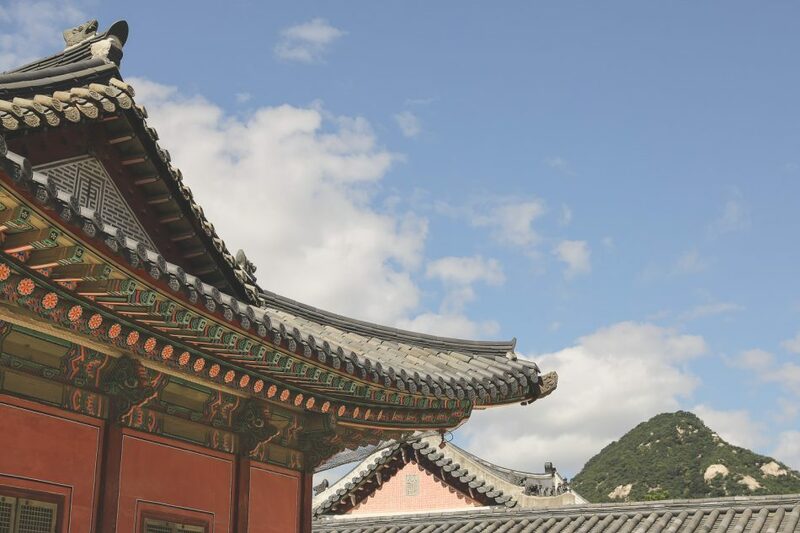 The houses are nestled close together with traditional tiled and curved roofs. 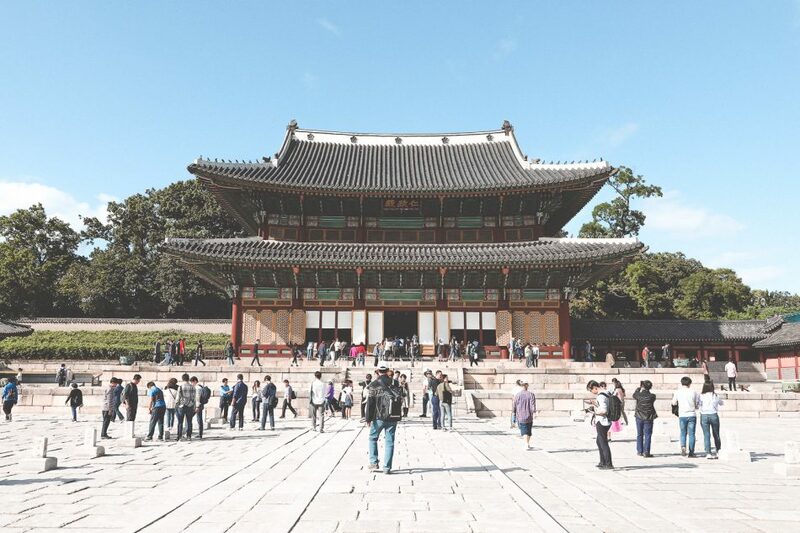 In the middle of the day, this neighbourhood is overflowing with tourists. So many tourists that there are workers employed just to stand throughout the streets and remind visitors to be quiet! 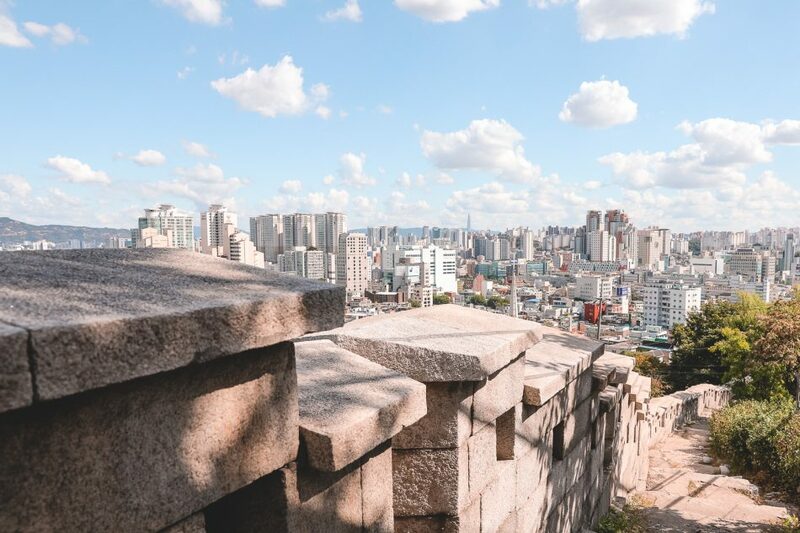 Surrounding this whole area is the old Seoul city wall, which you can walk along and enjoy views of the sprawling city. We caught some school kids playing along the walls, all excited to wave hello and practice their English with us. 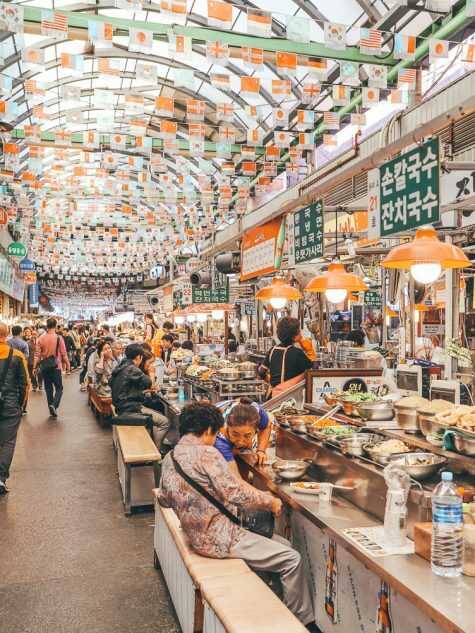 Seoul is a shopping Mecca, in both old and modern terms. 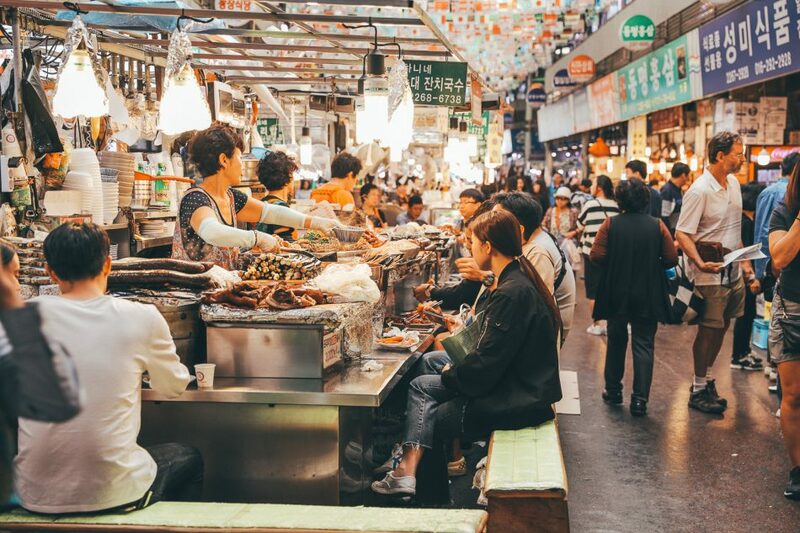 Myeongdong is the most well known area for shopping, home to large fancy department stores like Lotte and Shinsegae. Even if you are not willing to spend a dime, the shop owners try to lure you into their stores with free goods. Accept a free face mask in exchange for entering the store and looking around (you don’t have to buy anything). Sounds great but honestly, the hassle of getting a sales pitch every time I entered a store very quickly deterred me from accepting any free goods! 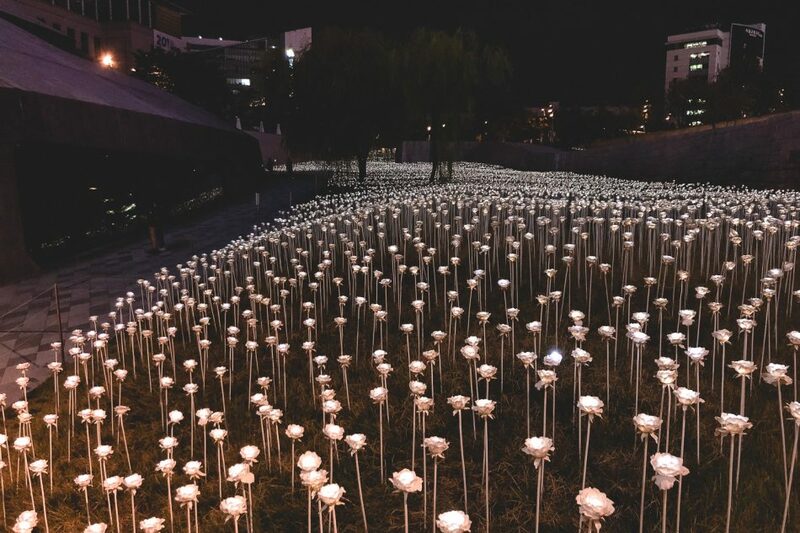 Insadong is the place for ceramics, calligraphy, art and souvenirs. 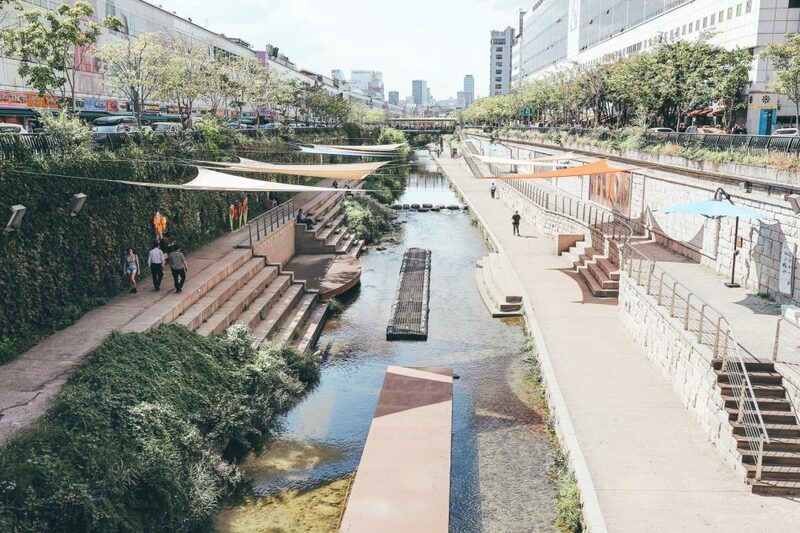 Wander into the back alleys to find a maze of trendy cafes, breweries and small restaurants. 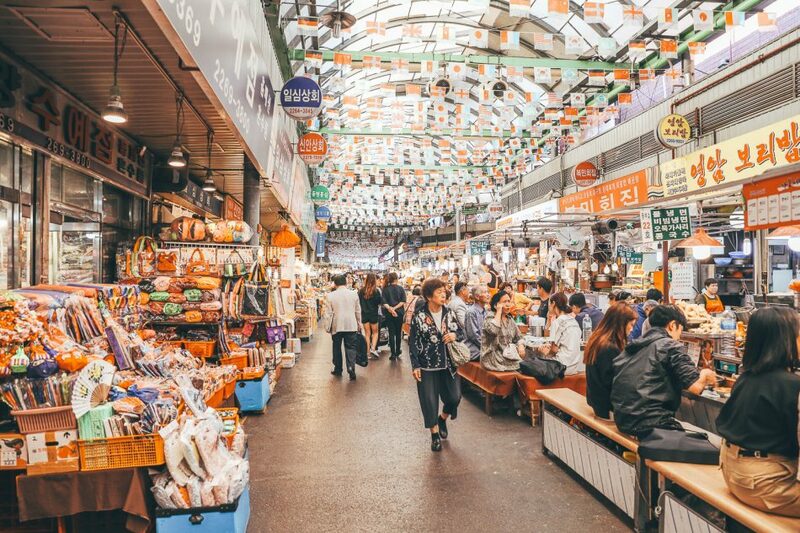 While home to many luxury boutiques, you can still find several traditional markets in Seoul. 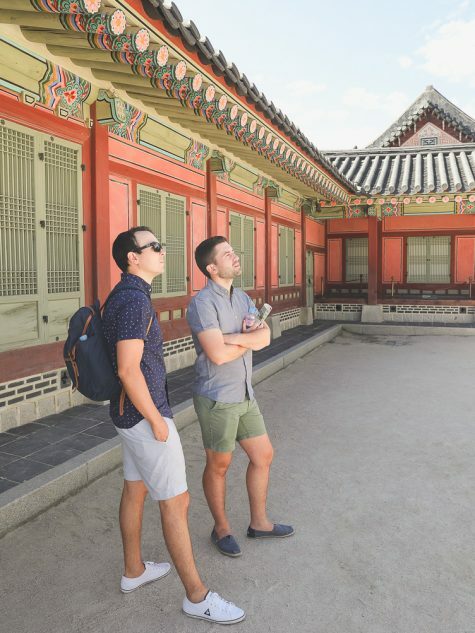 One of our favorites was Gwangjang, Korea’s first permanent market. 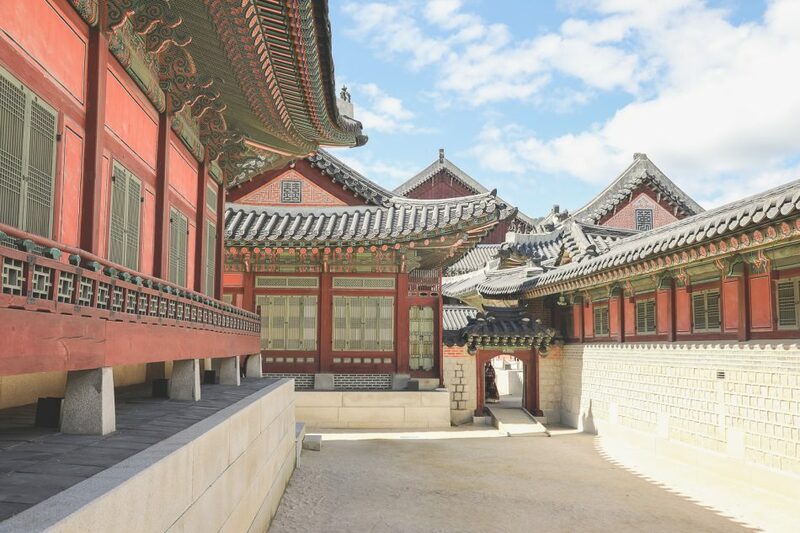 The first floor is full of little restaurants and stalls selling food, while the upstairs sells silk, satin and linens. 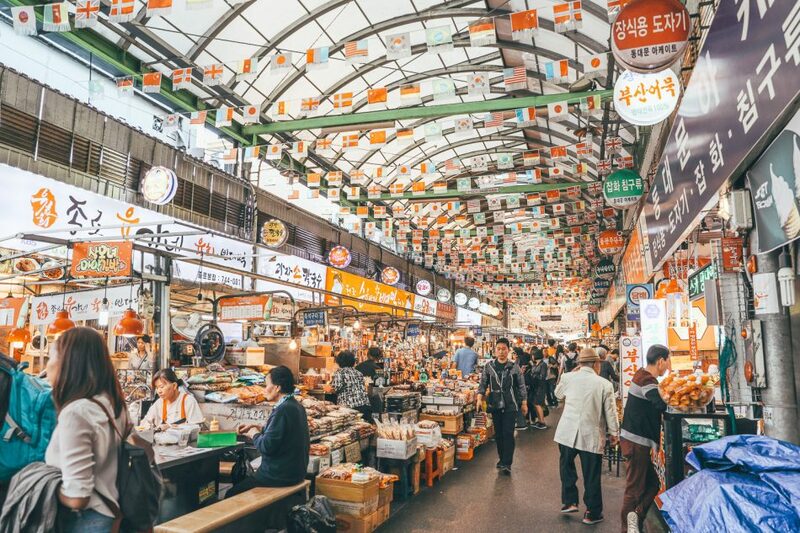 The ceiling is decorated with flags from various countries, a move by the government to attract more visitors to the once deteriorating market. And it worked! 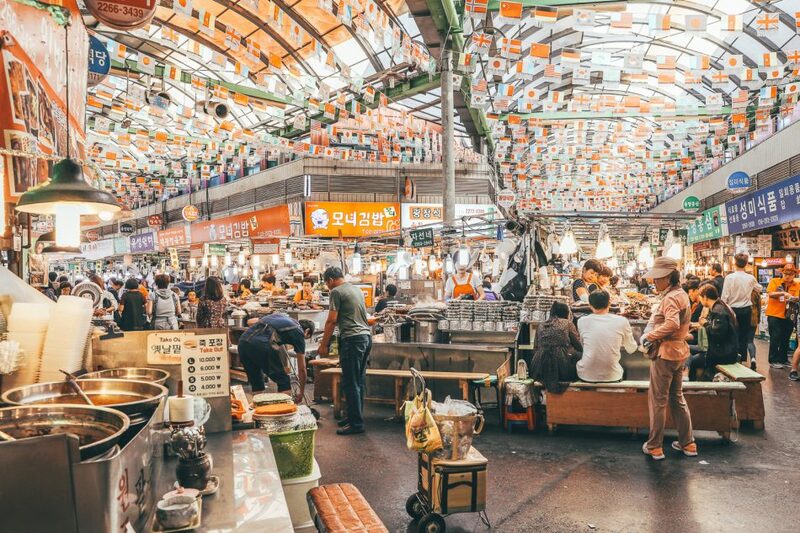 This market is the place to try bindaetteok (mung-bean pancakes), soondae (blood sausage) and gimbap (seaweed rice roll that looks like sushi). 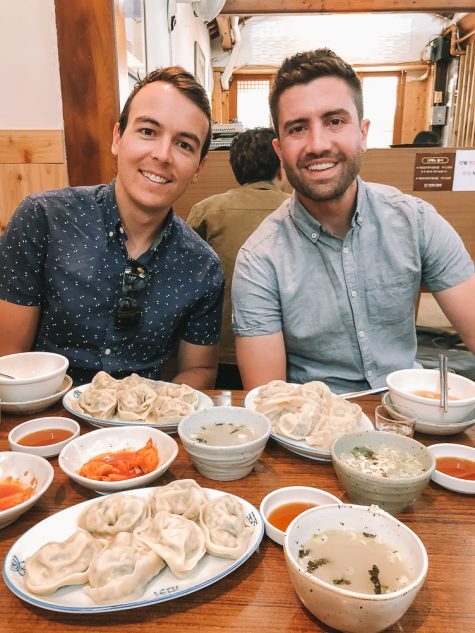 The Gwangjang market is where we spent a late night eating bindgetteok and had our first taste of live octopus after having one too many glasses of grapefruit-flavored soju… More on that (and more on Seoul) to come shortly! 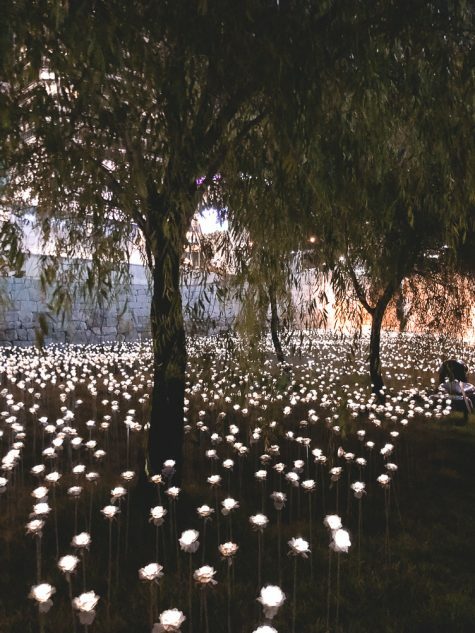 I simply keep on being amazed at what you are seeing and experiencing! Hmm. Live octopus. Does it attach its suction cups to the inside of your cheeks in a desperate attempt not to be swallowed?